January Jones – I don’t care who the Daddy is. No wait, yes I do. I love Mad Men. Love, love, love it. Ergo, I love celebrity gossip that relates to the cast of Mad Men. Sadly, most of them are relatively uncontroversial… most, but not the lovely January Jones. Much like her character, Betty Draper, January Jones (aka Cadence from American Pie 3) is prone to drama and sets tongues wagging. Here’s a recent pic of Xander with his Momma. Cute huh? What a cute little nugget! 1) Ashton Kutcher – The internet has been buzzing with rumours that Ashton may be the Daddy (fueling the fire for the Ashton/Demi split). The two used to date when January got to Hollywood, so there’s a “history” there. I suppose it’s possible, given Ashton’s penchant for blonde women who are not his wife, but I don’t know… I think this one might be a stretch. Ashton is just so angular, and the baby – not so much. 2) James Marsden – Before Ashton’s name got thrown in the ring, people were pointing fingers at James Marsden, January’s co-star in the latest X-Men movie. It could be an explanation for James and his wife filing for divorce, but it’s a tough call. Although… how many baby names start with the letter X? Perhaps this is an homage to the movie set on which little Xander’s parents had their first rendez-vous? If little baby X has both Jones and Marsden DNA, that’s not such a bad hand to be dealt in the genetics department. 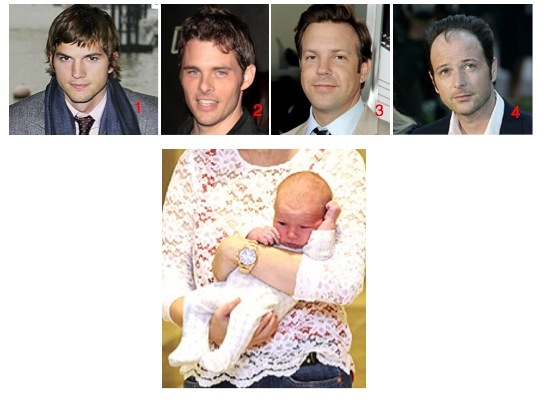 3) Jason Sudeikis – Jason and January were actually a couple, and according to reports they split up in January (wow that’s a lot of capital Js in one line), so the timing could work given Xander’s mid-September birth. This looks like the safest bet to me, but when asked about January’s pregnancy in May, Jason seemed legitimately confused and stunned. However, we must take in to consideration that the man is a professional actor, and secret Daddy of a Hollywood baby may be the role of a lifetime for him. 4) Matt Vaughn – Who? I had to look this one up. Matt Vaughn was the director of X-Men. Apparently he and January had an irregularly close relationship. This is further complicated by the fact that Mr. Vaughn’s wife is in fact super model Claudia Schiffer (aka – the woman who was once brilliantly cast as a Claudia Schiffer look-alike in the movie Love Actually). I don’t see a major similarity between Matt and Baby Xander, other than their equally sparse manes, but Mr. Vaughn has vehemently denied that he is the father of the baby. He doth protest too much, methinks. Will we ever find out who the daddy is? Part of me really admires January Jones for taking on a this huge challenge on her own and sticking to her guns, but a BIG part of my just wants to know! So what are you thoughts? Could one of these guys be Xander’s Daddy? * For the purposes of this post, “investigative journalism” involves spending a lot of time reading gossip sites. You have your methods, we have ours.